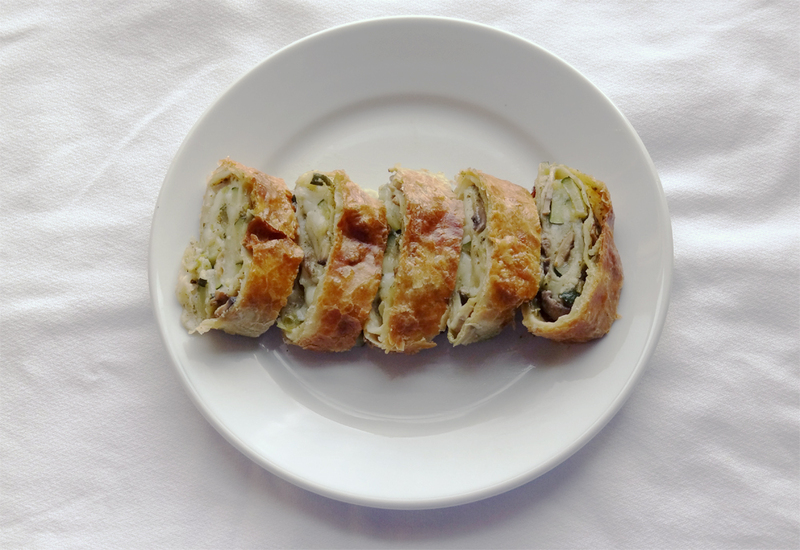 After a long weekend of lots of grilled, fried, and savory food, this wonderful Vegetable Mozzarella Puff Pastry Roll may be just what you need for a light dinner. I love it when I buy a product at the grocery store, have great intentions for the amazing dish I am going to make, and then end up stumped as to what to do with it. But, then as I discover by just going to the product website, I find a variety of great recipes. By starting with Pepperidge Farm Puff Pastry, you can make everything from appetizers to main dishes to desserts. Heat the oil in a 12-inch skillet over medium-high heat. Add the mushrooms, onion, and zucchini. Cook until the vegetables are tender and the liquid is evaporated. Let cool to room temperature. Unfold the pastry sheet on a lightly floured surface. Roll the pastry sheet into a 16x12-inch rectangle. 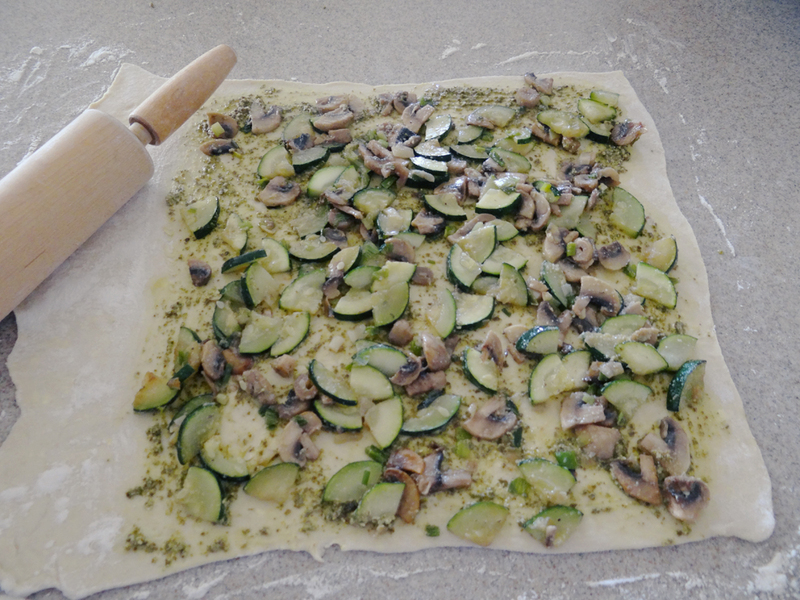 With the short side facing you, spread the pesto on the pastry, leaving a 1-2 inch space at the end of the dough. Spoon the vegetable mixture over the pesto. Top with the sliced mozzarella cheese. Starting at the short side, roll up like a jelly roll. Tuck the ends under to seal. Place seam-side down onto a baking sheet. Brush with the egg mixture. Bake for 25 minutes or until the pastry is golden brown. Remove the pastry from the baking sheet and let cool on a wire rack for 10 minutes. By simply layering the fresh ingredients, you set the stage for an amazing, appetizer or light dinner.